Bjørnstjerne Bjørnson (born as Bjørnstjerne Martinius Bjørnson in Kvikne, Norway, died in Paris, France) was a famous Poet from Norway, who lived between December 8, 1832 and April 26, 1910. He became 77 years old. With his peasant stories renewed Bjornson telling art in Norway in terms of form, style and human portrayal. It was also he who founded the modern saga drama and contemporary bourgeois drama and wrote the first real problem dramas. 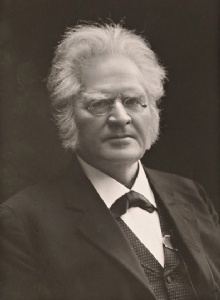 Bjornson is particularly appreciated as a poet and many of his poems are interpreted, including by Richard Nordraak, Halfdan Kjerulf and Edvard Grieg. Also, other Nordic composers have composed his poem. One of his country songs, yes, we love this country with the tone of Richard Nordraak, has become Norway's national anthem. Parliament granted him salary in 1863, and in 1903 he became the first Norwegian writer who received the Nobel Prize in Literature. He is also known as the founder of Riksmål Society. He was marketed as one of the four major Norwegian poets along with Henrik Ibsen, Jonas Lie and Alexander Kielland by Gyldendal publishing. He is born under the zodiac sagittarius, who is known for Philosophical, Motion, Experimentation, Optimism. Our collection contains 1 quotes who is written / told by Bjørnstjerne, under the main topic Life. "Life does not consist of words. Life is reality"